Many kinds of digital cameras, like Sony, Canon, Panasonic, JVC etc., store files in AVCHD format with MTS or M2TS file extension. The great advantage of AVCHD format is it can compress a big video file into a small package and keep the quality in high definition. But one problem is that HD cameras can’t shoot and save massive files, as it may record video in many small clips instead. If you shoot many separated small MTS clips and need to merge them for better watching or editing, do you know which tool you should choose? Here, we would like to share easy and effective AVCHD mergers. 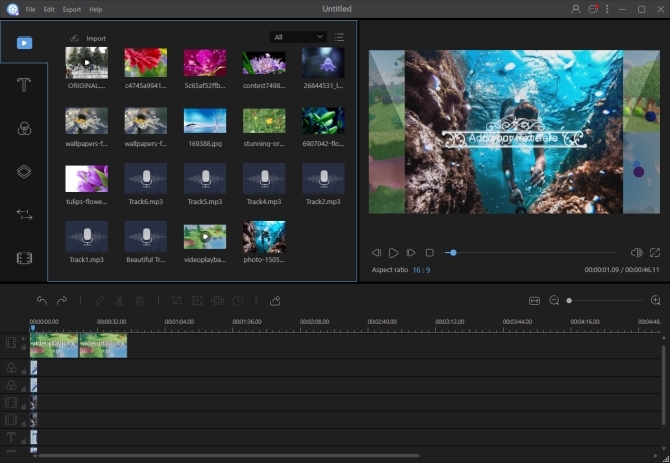 ApowerEdit is an easy-to-use and incredibly powerful video editing tool. It supports nearly all kinds of popular video formats, including MTS, MP4, AVI, 3GP, MOV, WMV, WEBM, ASF, MPEG and so on. You can use it to slow down, speed up, cut, crop, rotate, and flip video. It comes with hundreds of well-designed texts, filters, overlays, transitions, and elements. Using these beautiful templates, you can make a stunning video super easily and quickly. To join MTS files with this tool, you just need to follow these simple steps. After launching the program, import your MTS clips by clicking “Import” > “Import file”. Drag and drop the files to the video track on the timeline. You may arrange them by moving the video thumbnails on the timeline freely. Before you start to output the files, you may edit them by cutting unwanted parts, cropping video size, adding mosaic or filter, overlaying effects etc. Click “Play” on the right pane in the Preview window to preview the whole video. When you are ready, click the “Export” button above the timeline to output your work. Supports two PIP, text, overlay, music, and filter tracks. Offers various kinds of fantastically animated intro subtitles and overlays. Allows you to use Ctrl+B shortcut keys to split files on the tracks flexibly. Can help you export your video file with default parameters. Video Converter Studio is an all-in-one video converting tool that enables you to convert video or audio into a wide range of popular formats. It has a built-in video editor that can trim video, rotate, flip, crop video, sync video and audio, add watermark, subtitle to video and so on. It includes a great video downloader for helping you download videos from YouTube, Vimeo etc. Moreover, there is a practical screen recorder that can capture any screen activities with audio on your computer in full screen or region mode. 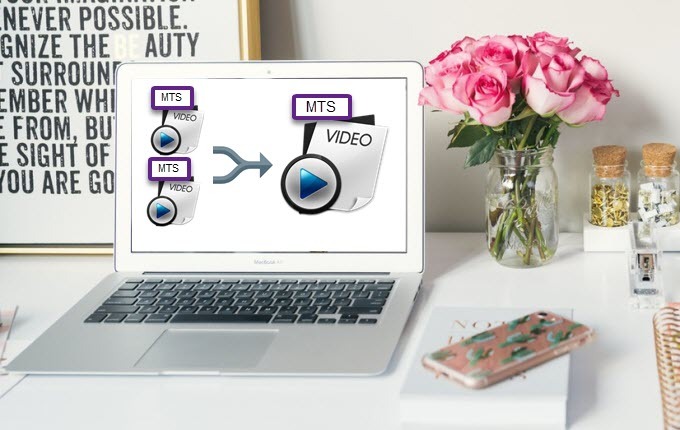 Designed with an intuitive interface, Video Converter Studio makes it easy to combine MTS files. Click the Download button below to download and install the program. Import your MTS files by dragging them to the +Add files area on the left pane. You may also click “+Add files” button to load your files. Check “Merge into one file”. Choose the output file format as any video format you need. Click “Settings” if you need to set the video parameters, like frame rate, resolution, bitrate etc. Click “OK” when you are done. Choose the output directory according to your need. Click “Convert” button and then let the program do the job for you. 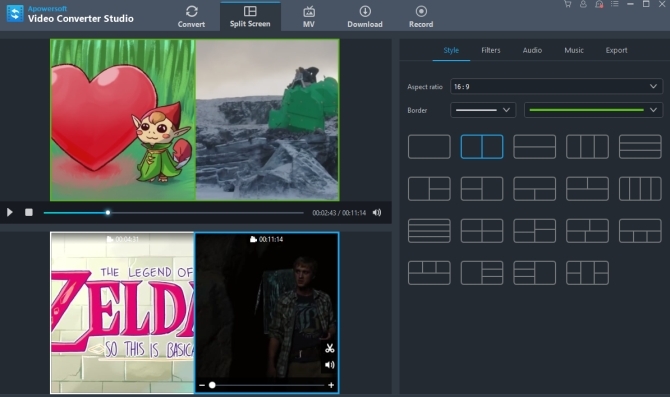 Can help you make a stylish split screen video in two, three, four, and five screens modes. Allows you to transform photos into amazing slideshow presentations instantly. Free Video Joiner is a lightweight program developed for Windows. It supports a lot of formats, including m2ts, ts, mts, m2t, wmv, mp4, 3gp, 3gp2, rmvb, rm, rv, asf, flv, amv and so on. 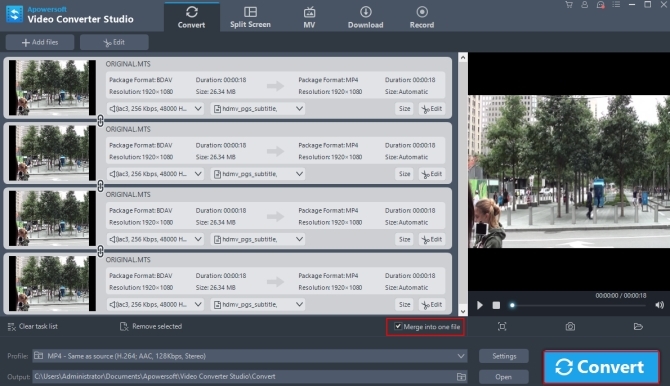 To use this AVCHD merger to join your files, you must make sure they use the same codecs. It can detect your computer’s hardware configuration and give out the optimized join scheme. It can join video files with a fast speed and preserve your video quality. You only need to finish a few clicks to complete your task of joining files. Go to Softonic website to download and install the program. After running it, click the “Add” button to import your clips. Click the “Join” buttons to start merging files. Notes: You can only join two files at a time when you use the free version of the program. Without completing any special settings, you can use the 3 tools shared above to merge MTS files easily. 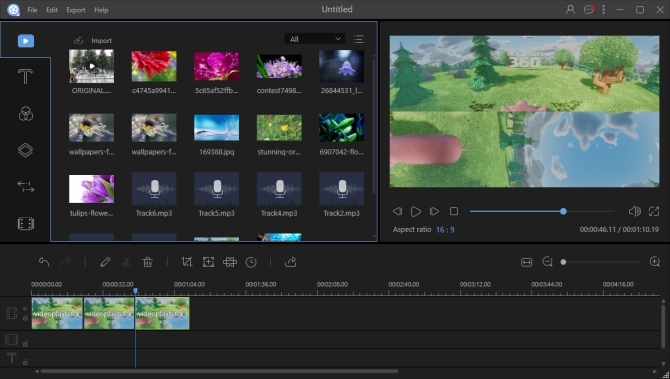 If you need to do other video editing tasks, ApowerEdit would be a more suitable tool for you. To convert MTS to other video or audio formats, we recommend you to try Video Converter Studio. Free Video Joiner is a good choice for home users to join just a couple of video clips.